Memorial Day is around the corner and I couldn’t be more excited! It means warm weather and the summer party season has officially begun. For me, I’m feverishly working through all my ideas for summer food that I’ve stashed away over the long Winter. 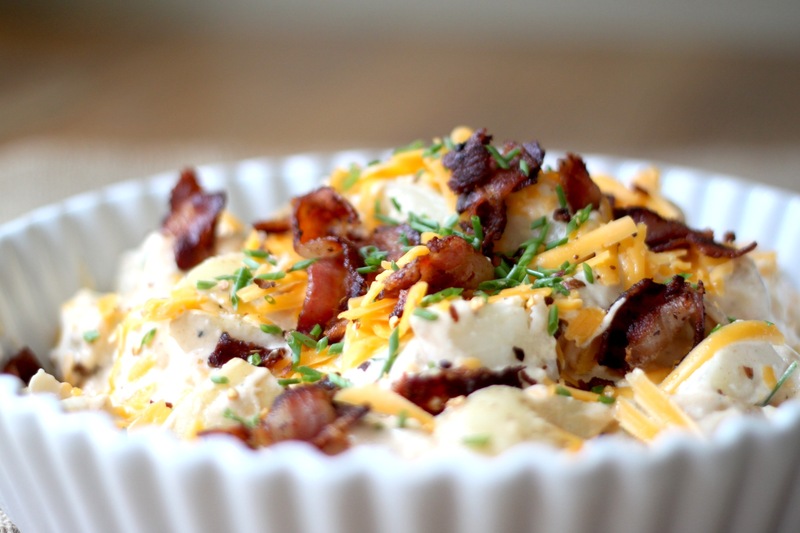 That brings me to this amazing little potato salad. 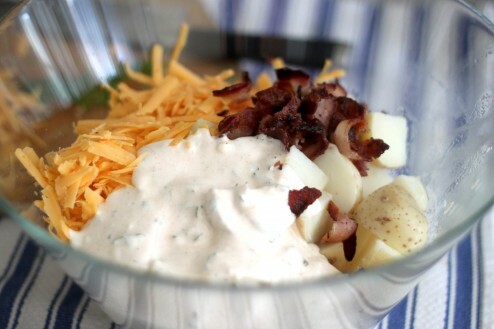 See, typically I’m a one bite potato salad girl- it’s in the category of those foods where the first bite is amazing and every one after that is downhill. It always seems like a good idea at the time and then halfway in its like, why am I eating this? Well, this potato salad isn’t like that, I literally had to tear myself away before I ate the whole bowl! I’m about to let you in on one of my little secrets. When I boil potatoes for any dish, in addition to salt, I add in a couple of sliced or smashed garlic cloves and 3 or 4 bay leaves. 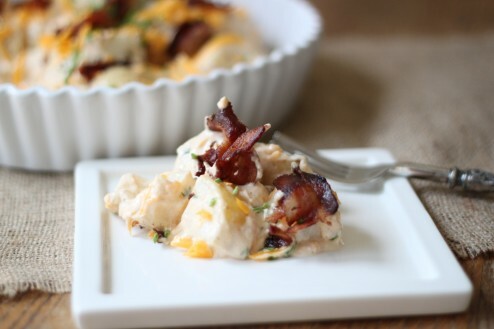 There is a depth of flavor that the potatoes take on with those two ingredients that is just simply amazing. Also, its really important to keep an eye on your potatoes. You want them soft yet firm; I know that’s kinda vague. If you cook them too much, they will totally break apart, not enough and they will be crunchy. So just keep testing them every 5 or so minutes after they start boiling. You want to be able to stick a knife in them easily but not have them crack when you do. Here is the sauce mixture. If you want less of a kick, just cut down on the vinegar. Want more heat? Add a little chili powder. You can do anything you want! Also another trick with this is to add about half of your dressing to the potatoes. The recipe calls for 8 – 10 spuds but I didn’t specify the size and as we know, every potato is different. Just start with half and then add more to get the desired consistency. This isn’t one of those fussy recipes so if you need to mix up a bit more that what the recipe calls for, go for it. A nice close up. I have to say I like this salad just a little warm and not too chilled down. 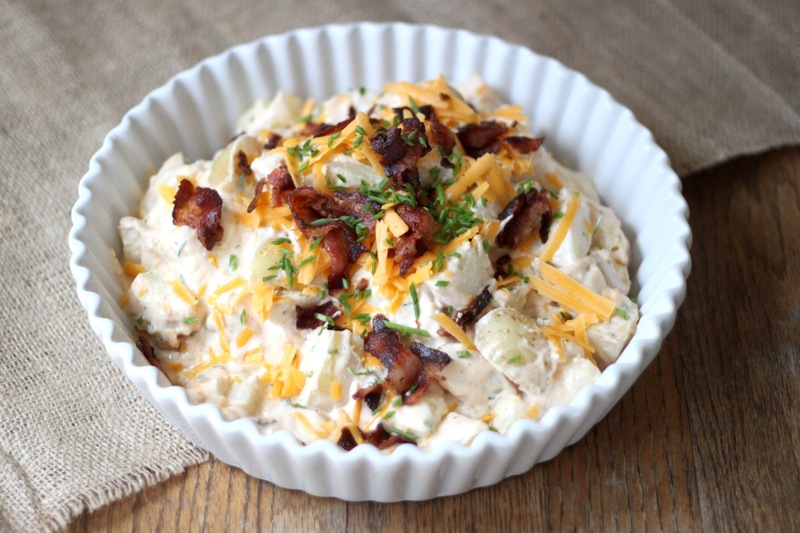 I’m thinking you should add this to your Summer gathering menu – I’m just saying! Have a wonderful day. 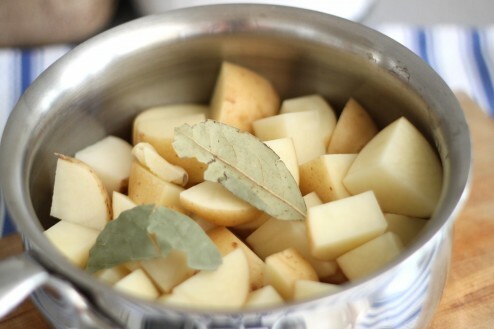 In a large pot heat potatoes in salted water with 3 crushed garlic cloves and bay leaves just until fork tender. While potatoes boil, cook your bacon until crispy. Remove and let drain on a paper towel lined plate, reserve 3 tablespoons of bacon drippings. When bacon cools, crumble. Drain potatoes well once they are cooked but not falling apart, removing the bay leaves and place in a large mixing bowl. Let cool down for 5 minutes or until the potatoes dry. In another bowl, mix sour cream, mayonnaise, herbs, spices and vinegar. Into the potatoes, add reserved bacon drippings, minced garlic, sour cream mixture and pepper, mix well being careful not to break the potatoes down too much. Fold in two thirds of the bacon, scallions and cheddar. Salt to taste. 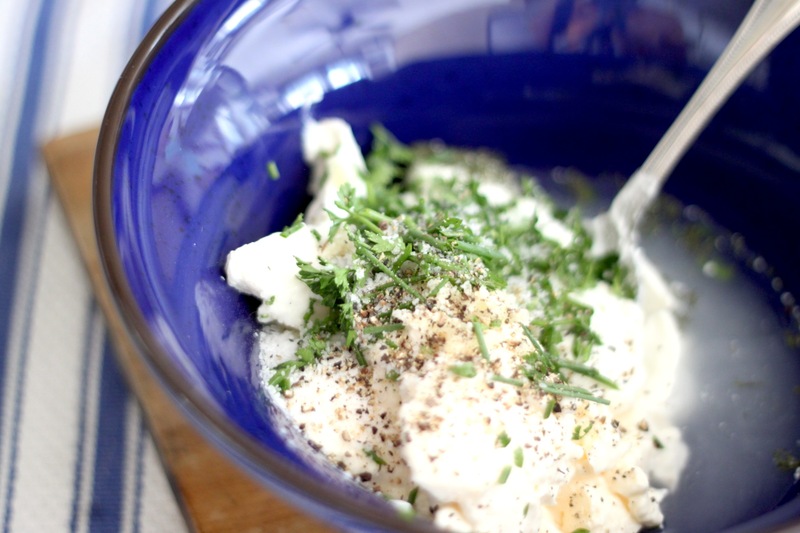 Place in a serving dish and refrigerate for 20 – 30 minutes. Cover the top with the remaining bacon, scallions and cheddar and serve.